Some wild animals that live around humans are considered pests. Around our area, we have raccoons, skunks, opossums and some rodents. Most of these critters are attracted by food and/or shelter. It is unfortunate that many people who are dealing with these critters, believe the only way to get rid of them is to kill them. This usually involves poison, shooting, or worse, and there is no guarantee more will not return. It is my opinion that these solutions subject animals to needless pain and suffering. Many larger "pest" animals also help reduce populations of harmful insects like small rodents, grubs, spiders, termites, and critters harmful to gardens. Here are some suggestions which come from the most common issues I hear from people regarding their pest problems. In my opinion, the best solution is to make your home undesirable to "pests" - avoid providing access to the things pests want. 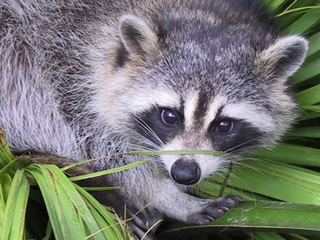 Most people I have spoken to who have a raccoon or skunk problem for example, reveal that they feed their own pets in areas which are not protected from wild critters. In addition, a common practice is to put food in the pet's bowl, and leave it alone. If the pet doesn't consume the entire serving, it sits around. The smell of pet food is extremely irresistible to many wild critters and they can smell it a mile away, especially if it has been sitting for a while. If the feeding area is outside or in an area accessible, to critters, it will attract the riff-raff. Pets should be fed, then the excess food should be removed. This not only reduces the time the food is out, but it is also healthier for pets. Most veterinarians would probably agree, "free-feeding" your pet is not as healthy as controlling mealtime yourself. Many people feed their pets in an indoor area, but also have a basic pet door which any critter can pass through. An automated pet door which allows only the family pet (s) to come and go will ensure only "authorized" pets have access to the food, and will keep all others out. Wild critters might smell it, but once they realize they can't get to it, they will eventually move on. Scavengers are opportunists. 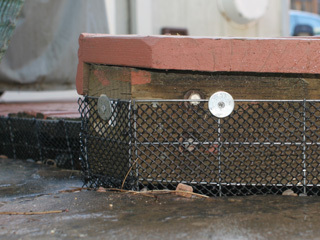 In addition to good pet feeding practices, pest-proofing your home is a good idea. Close or screen-off gaps, holes and cracks where critters can get in and under. Of course you need to be sure to not trap any critters anywhere. In our case, we had a family of skunks living under part of our deck. We did some research and discovered they like to have "escape routes" near their den. We screened off their "back door", and after verifying they were no longer using their den, we closed off the rest of the area. 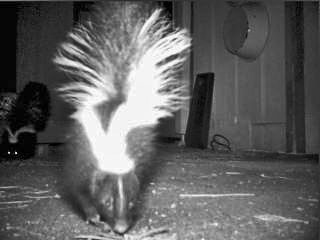 The skunks are gone, and we sleep with a clear conscience, knowing we "evicted" our four-footed squatters without causing any pain and suffering. In addition, your own pets will be safer from potential injuries and disease. Makes Sense!